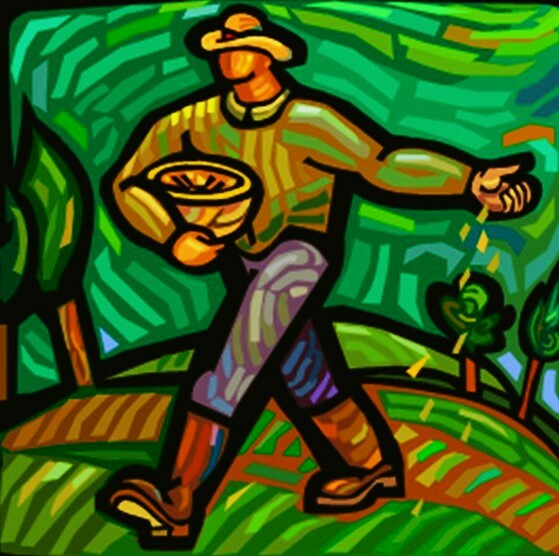 Paul gives us all a bit of a dig today: ‘thin sowing means thin reaping; the more you sow, the more you reap.’ What a challenging opening line to a reading. I was sitting at Mass this morning when I heard this line and immediately I thought of how little I sow in the world. It was one of those moments when I knew that I still don’t do enough in the Christian life. I am too concerned about money, work and all the other things that surround us in our daily lives, to be able to give full attention to God. The mortgage needs to be paid, there is work to be done…..these are just some of the excuses I use. But maybe, I thought to myself as I sat there half awake, maybe I could do a bit more loving and be a bit more caring. Then a part of me thought that it was too much bother. What a wretch! We are strange beings us humans. We are always torn this way and that and yet God calls us ever to go forward, trying to make a little progress every day. This morning I felt that I had made no progress from the day I first heard of Jesus….but that is an illusion. We are making progress, we need to get away from believing the feelings and trust more in our reason. It is my reason, that there is a God and he is worth following, which keeps me going to Mass every day. When we keep this up for years there must be progress somewhere. Wee note: If you get a chance today, go to the Universalis site and read the reading from the Office of Readings by St Cyprian on the Lord’s Prayer. It is brilliant. Today is the feast of the Sacred Heart. It is one of those moveable feasts that depends on the date of Easter. Devotion to the Sacred Heart of Jesus can be clearly traced back at least to the eleventh century. It marked the spirituality of Saint Bernard of Clairvaux in the twelfth century and of Saint Bonaventure in the thirteenth. In these few words we have summed up the whole theology of the doctrine of the Sacred Heart. Leaving the theology behind, what does this feast mean for us on a day to day basis. It gives us contact with God, close contact with the very heart that lies at the centre of the Trinity. It is an incredible thought that through Jesus we have access to the deepest heart of God: and it is a heart that is human, that lived our fears and loves and felt every emotion that we have ever experienced. What a wonderful, secure and loving God, a God who can let us get so close to him. Over the next couple of weeks the gospel of the day is taken from the Sermon on the Mount. This phase began yesterday with the reading of the beatitudes. Today we move on to the next few verses of chapter 5 where Jesus tells the disciples that they are to be the salt of the earth. In the next verse he tells us to be the light of the world and that our light should not be hidden under a lampstand. These are challenging words. Jesus is calling on us to profess our faith in him both by our actions and our words. This is not an easy call. We are expected to be examples of Christian living to those around us and we often fall short of the mark. And yet Jesus expects us to be some sort of beacon for the people we meet in life. Perhaps he wants us not so much to show how holy we are or how good we are, but to show that joy which is the mark of the Christian. Over the years I have come to learn that this is the great mark of the person who loves God: they may be far short of the Christian ideal but there is something inside us that lets us know that no matter what happens there is a God who loves us. The effect of this is that we have joy in our hearts. This joy is what attracts people, not rules and regulations or obedience to stern laws. In today’s gospel we have the perfect example of the difference between the way we see the world and the way that God sees it. The Sadducees come to Jesus and ask him a question. The Sadducees were a group of Jews who did not believe in the resurrection or an afterlife, so they posed to Jesus one of the questions that they thought proved their case. In Jewish law, if a man died before he had any children, his brother had to marry his wife and have children so that the original man’s line of inheritance could continue: it was a sort of proxy child to inherit the man’s property. On the face of it you have to say that the Sadducees had a good case. But Jesus pointed out that God’s ways are not our ways and that heaven shall be a totally new way of living and seeing. We shall not be constrained in the way that we are now: it shall be totally new, something we have never dreamt off nor have we conceived.